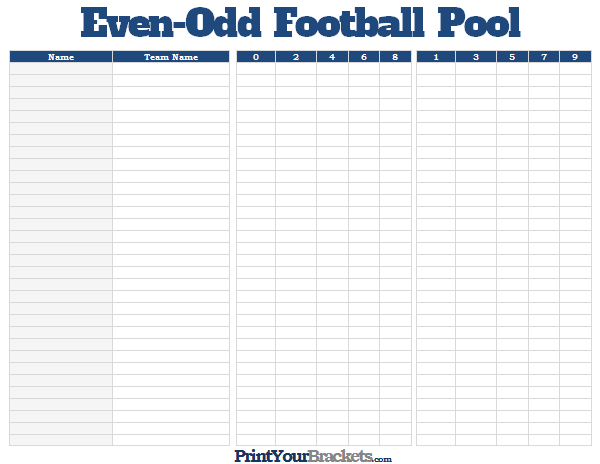 Below you will find our printable Even-Odd Football Pool. The overall idea of this pool is to randomly assign each participant a team and then use the total points scored each week to mark off the even and odd numbers. There are two winners to this pool, the first person to mark off all even numbers and the first person to mark off all odd numbers. You can read for instructions on running this pool at the bottom of this page. This pool is designed to start before the first game of the NFL season. We have simplified the drawing by providing this Printable List of NFL Teams. 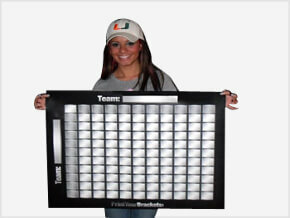 Simply print that paper, cut the team names out and put them in a hat. After the participants names are filled in, randomly draw each team and place the team name beside the participant's name. Each participant will use 1 team for the entire season. The sheet above has spaces for 32 teams, you can either use all 32 teams, even allowing participants to have multiple entries or you can just use the the number of teams that equals the number of participants and leave the rest of the teams out. The object of the pool is to be the first person to mark off each digit from either the even or odd number list. There are two winners of this pool, a winner for the even numbers and a winner for the odd numbers. To mark off a number you will use the last digit of the team's score. If at the end of the season one of the sets of numbers has not been completely marked off by any of the participants, the person with the most numbers in that set marked off would be declared the winner.